Air travel technology provider SITA says travellers are increasingly using technology services for every stage of the journey, from booking the flight to immigration clearance and keeping track of their checkin bags. The annual SITA passenger IT insights report found there were higher satisfaction rates for those using technology across nine different stages of the passenger journey. “One of the stand-out findings of this year’s study is that passengers are more satisfied when they are using technology,” the report said. “The contrast in satisfaction between tech-enabled passengers and those who relied on face-to-face service is particularly marked at three key points – during dwell time (+5.8 per cent), on board the aircraft (+8.1 per cent), and when collecting luggage at the carousel (+8.6 per cent). 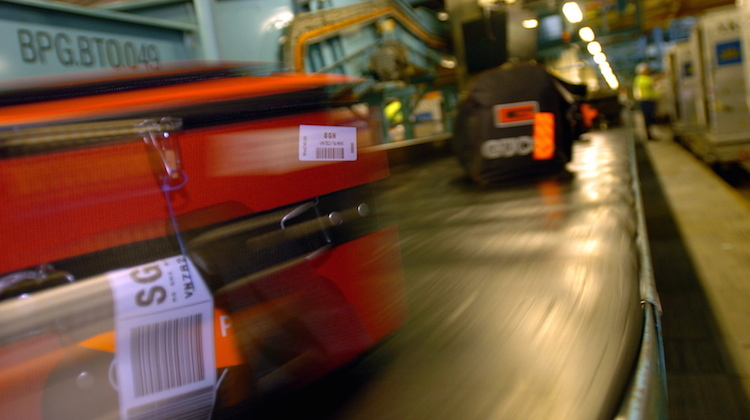 The SITA report said the International Air Transport Association’ (IATA) Resolution 753, which required airlines to keep track of luggage at four stages of the journey – checkin, loading onto the aircraft, transfer and arrival – represented a “great opportunity to keep passengers proactively informed”. The resolution came into effect in June 2018. “Baggage claim remains a pinch point in the passenger journey, so access to information on arrival is key to minimizing stress and frustration,” the SITA report said. 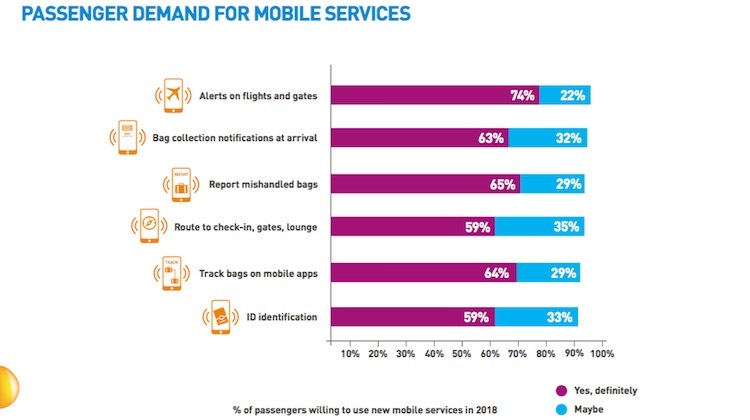 Further, the SITA report said 26 per cent of passengers used their mobile device to receive status updates on their baggage at arrival in 2018, up from 14 per cent in the prior year. SITA director of baggage Peter Drummond noted airports and airlines were increasingly tracking bags at key points of the journey. “While this tracking data is primarily used to provide better oversight of baggage and reduce mishandling, many operators are providing some, or all, of this information to passengers as a mobile service,” Drummond said in a statement. “This is being done either through the airline or airport mobile app or other notifications such as SMS. 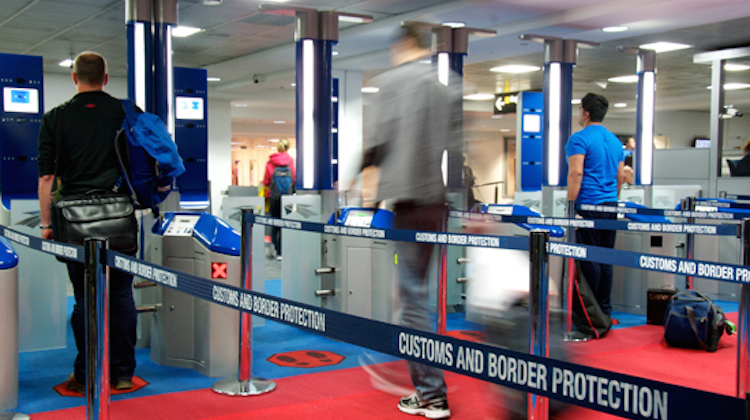 On border processing, the SITA report found the percentage of travellers who used self-scanning gates or checkin kiosks to verify their identity more than doubled to 44 per cent in 2018, compared with 21 per cent in 2017. And passengers who used these self-service options experienced higher satisfaction rates than those who had their identification and travel documents checked by a human agents. 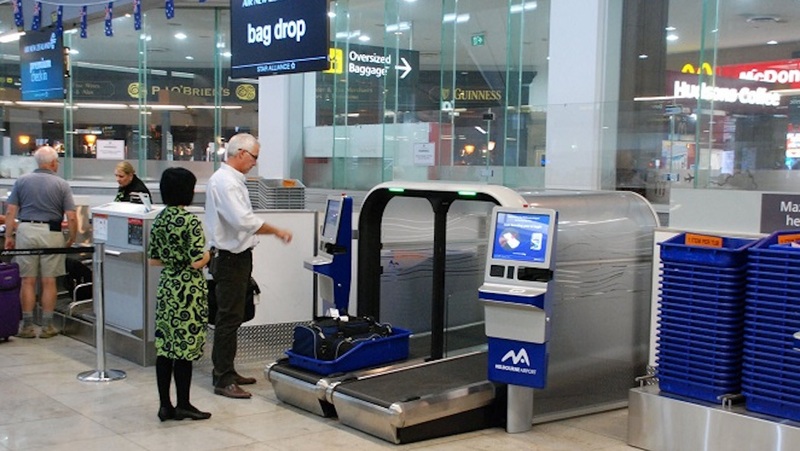 A new generation of smartgates at Australia’s international airports should mean about 90 per cent of international travellers will be processed automatically, with no human interaction, by 2020. 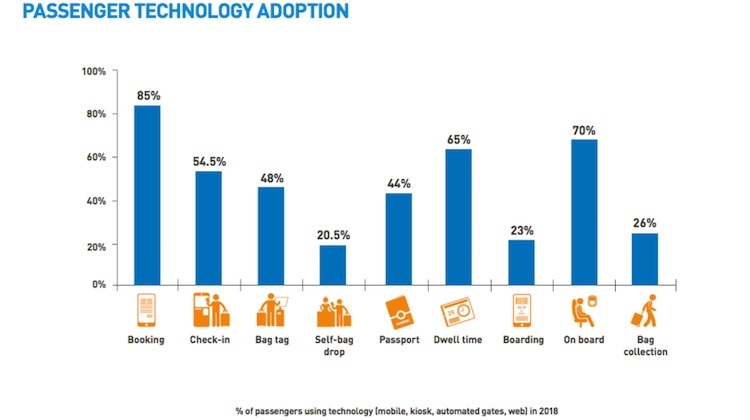 The highest rate of passenger technology adoption was at the pre-travel stage, with 85 per cent of those surveyed booking their tickets online. The survey was completed in the second quarter of calendar 2018 and comprised online responses from 7,578 people from 20 countries across the Americas, Asia, Europe, Middle East and Africa. VIDEO: A November 2017 video of passengers using Smart Path technology from SITA’s YouTube channel.